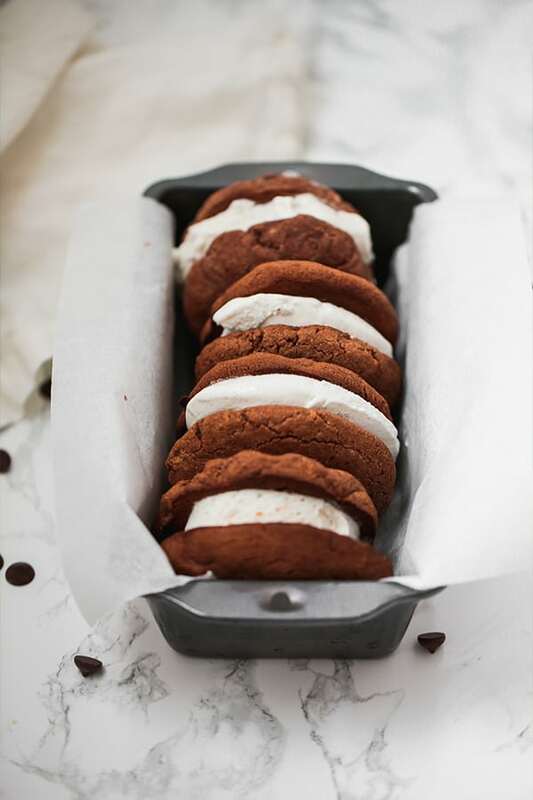 These chocolate cookie ice cream sandwiches are the ultimate summer indulgence! They’re paleo, AIP compliant, gluten, dairy, and egg free. Every single year, the summer heat blindsides me. It doesn’t matter how many summers I’ve spent living in Texas… nothing can prepare you for 105 F degree temperatures, scorching hot steering wheels, and sky-high AC bills. I am MUCH more of a pumpkin spice, fall girl, but sometimes you just have to have fun with what you’re given and try new ways to beat the heat. 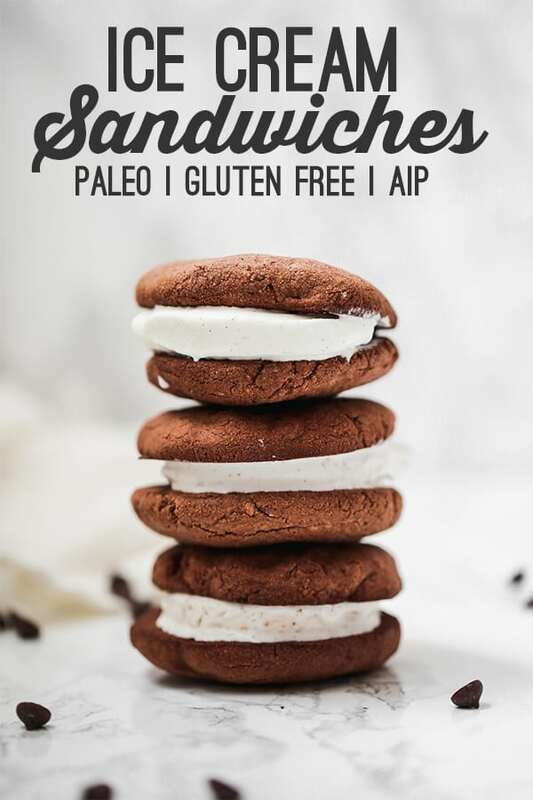 Like… paleo ice cream sandwiches! 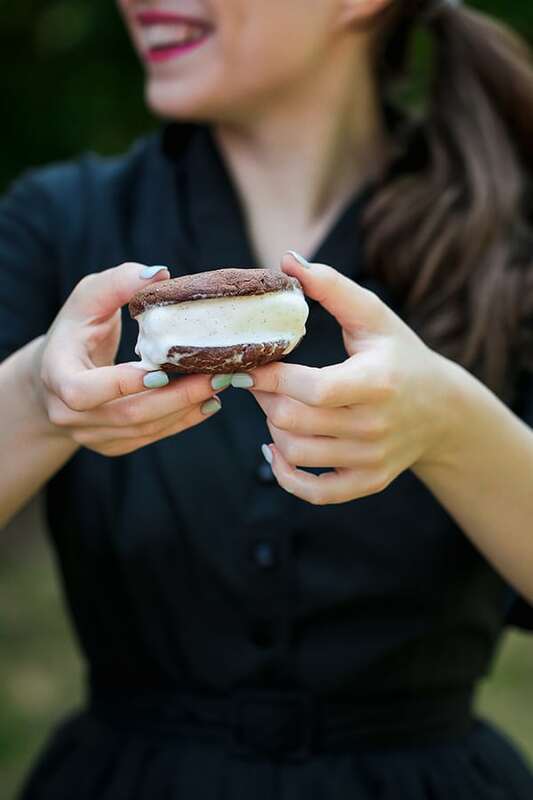 When I was a kid and the ice cream truck would roll around, ice cream sandwiches were always what I would go for! I loved the soft cookie and the creamy ice cream all in one little conveniently wrapped plastic package. But clearly, it was made by a machine and loaded with junky ingredients. So I decided to make my own this year! One that’s homemade, gluten free, dairy free, paleo, and even AIP! First, they’re husband approved!! My husband is a big dairy guy. He lovessss cheese and he calls ice cream “dessert cheese”.. which cracks me up every time. He’s actually a-okay with coconut milk based ice cream, but he immediately turned up his nose when I told him I was attempting ice cream sandwiches. He thought there was no way I could pull it off and hated my first three attempts. When I finally nailed it, I ran into his office and gave him a bite, which was followed by “mmmmmm…. delicious!”. I did a happy dance and went to walk away when he said, “wait… can I have more?”. So yeah… they’re good. Second, they are best fresh. I tried several times to get them in the cookies themselves to come out from the freezer without getting too hard, and it just didn’t work. They’re too hard to bite into when they freeze and are best eaten and assembled fresh. If not, you can store the cookies in a Tupperware in the fridge and assemble them seperately. Tigernut is actually a tuber (not a nut), and this is the only flour blend I tried that worked for these cookies. I tried without coconut, and it just didn’t fly. You can likely sub arrowroot for tapioca, but that’s the only swap I can recommend in good conscious. Carob is the AIP sub, but cocoa works as well! You can also use honey. I haven’t tried other fats here. Don’t swap this out or sub collagen! The cookies won’t work. I use vital proteins gelatin. Preheat the oven to 400 F and line a baking sheet with parchment paper that’s lightly greased with coconut oil. In a large bowl, stir together the dry ingredients and set aside. Mix in the wet ingredients and stir well until fully incorporated. Roll the dough into 6 balls, as evenly portioned as possible, and flatten each ball onto the cookie sheet. You want the cookies to be mostly flat, but not paper thin. Bake in the oven for 9-10 minutes. Cool on a cooling rack for 20-30 minutes or until cool to the touch. 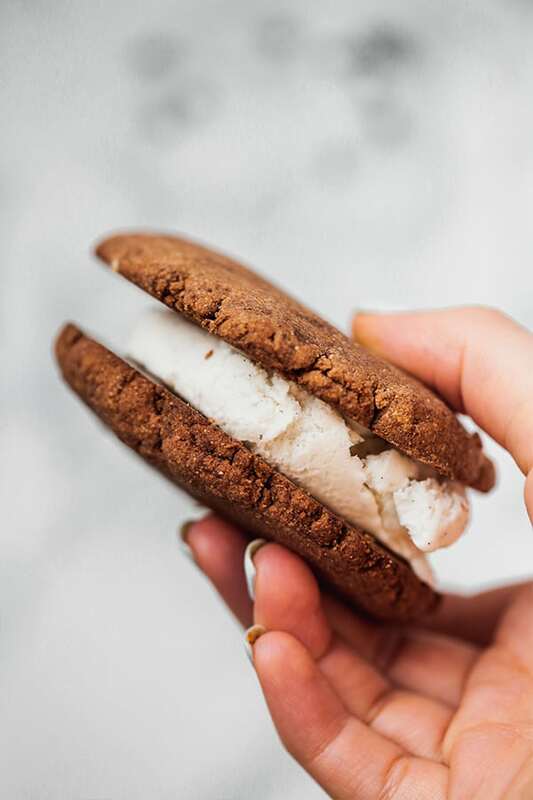 To assemble, sandwich one-two small scoops of ice cream between two cookies and eat immediately. 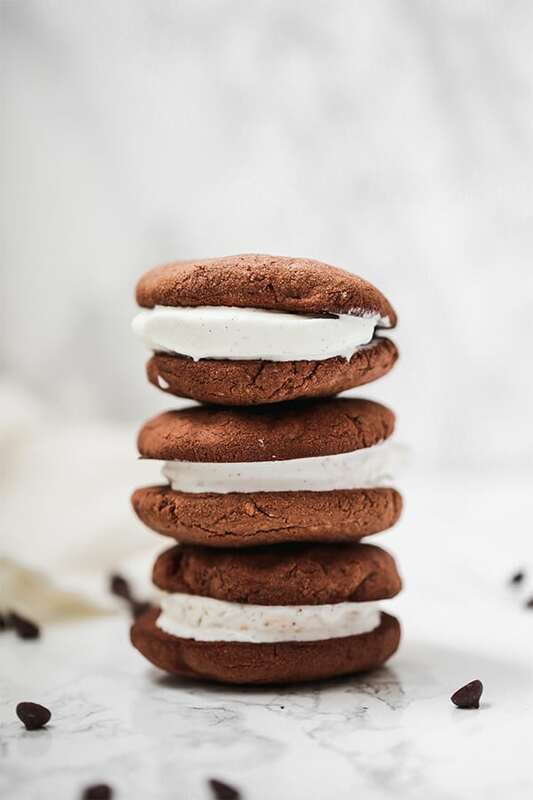 If you have leftover cookies, do not freeze them with the ice cream, or they’ll be too hard to bite into… these are best fresh or stored in the fridge rather than the freezer. 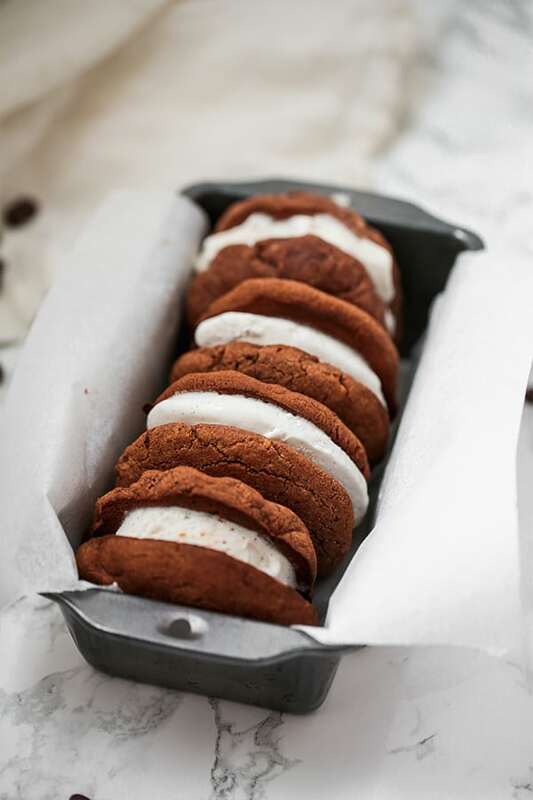 Eat these with vanilla ice cream, strawberry, chocolate, or heck… whatever you want! You can even just make the cookies if you want a big ol’ cookie. No matter how you eat it, stay cool! !